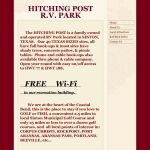 Ask fellow campers about "Hitching Post RV Park" and nearby attractions. had a nice size yard for our dog. FREE wifi. Also very easy on/off access to Hwy 77. We camped at Hitching Post RV Park in a Travel Trailer. 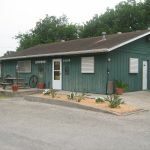 Very neat and clean RV park, owner on premise and was very friendly & helpful. We enjoyed this park and would certainly go there again. 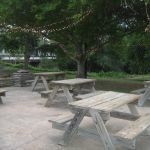 The sites are ample, with a picnic table on a small patio and a nice yard area. The laundry and bathrooms were clean as was the commons room. Many of the people who are there are returnees and have been there for many years. They do have free wi-fi In the recreation bldg. We camped at Hitching Post RV Park in a Travel Trailer. This park is listed in the Good Sam parks book, but we were told they haven't belonged to GS for 12 years. Bathrooms and showers were closed to the public. Owner's brother checked us in. He told us that the residents are mostly pipe line workers and he thinks that's why the bathrooms and showers are closed. She had trouble keeping them clean. He was friendly and the park is decent looking. We camped at Hitching Post RV Park in a Motorhome. 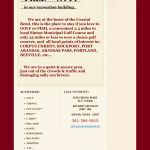 Are you affiliated with Hitching Post RV Park ?